This really isn't new, Google has been doing this on desktop for a while and testing it on mobile for a long time as well. If Google thinks it knows what your query will be, Google may show instant answers directly in the search auto-suggestions/auto-complete bar. 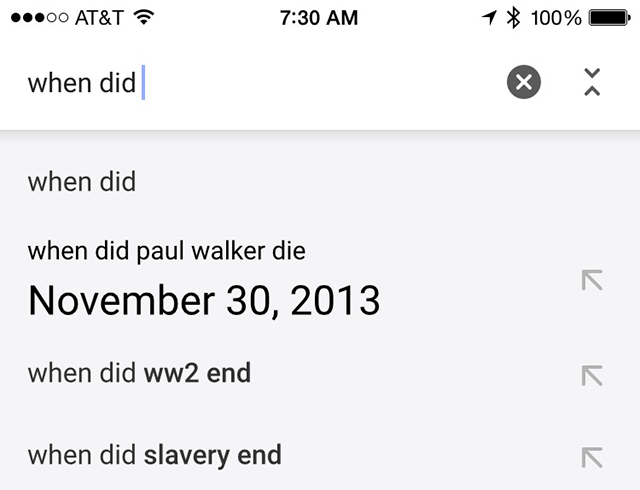 My intent was not really to search for that query but Google showed me the answer for that query and I stopped adding words. But you get the point. TheNextWeb covered this as being new last week, but really, it isn't. It isn't often where a searcher will see this, especially on mobile, just because of the manner searchers search on mobile devices. But I guess it is important to show, since this doesn't even trigger web results or even ads at this point (although I've seen Google test ads in the auto-complete results).